The Maax Living 6642 drop in tub offers a contemporary design with a harmonious oval shape. The Maax Living is an ergonomically perfected tub for absolute relaxation. The Living has an extra-spacious interior and plenty of leg room for unparalleled comfort. The versatility of the Living makes it one of our most popular tubs. Also available as an air tub, whirlpool tub or air/whirlpool combination. Call 800-720-1062 for more details. Winter Sale! Big Savings on All Maax Tubs! Free Shipping and No Sales Tax! Call for Best Pricing! 800-720-1062. 42" x 66" x 23"
The MAAX Collection's premiere perimeter air injection system. Up to five dozen intelligently positioned air jets provide a hushed ripple of well-being by cradling your body from head to toe. Advanced check valves ensure immaculate purity making Aerofeel® the most hygienic, as well as the most delightful, system on the market. Bathe yourself in a kaleidoscope of color and envelop yourself in optimal health. Experiment and discover your perfect combination of the pulsating healing ability of water massage and the gentle reassuring ripple of air jets. Activate our water and air systems together for maximum effect or devise an alternating program that fulfills you head to toe, in and out – body, mind and soul. 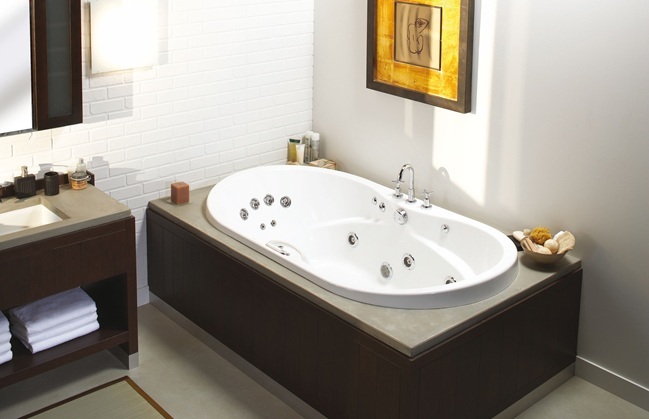 Hydromax is an exclusive whole-body whirlpool bathtub system. Powerful, high-performance water jets strike with precision to effectively relieve aching muscles, stimulate the body and melt away the stresses of life. Your ears deserve the same luxurious treatment as your muscles but spa noise can easily disrupt even the most tranquil atmosphere. MAAX puts that concern to Rest, a silent whirlpool massage system available on bathtubs with our True Whirlpool, Hydromax or Hydrofeel massage system. Hydromax is an exclusive whole-body whirlpool bathtub system. Powerful, high-performance water jets strike with precision to effectively relieve aching muscles, stimulate the body and melt away the stresses of life. This MAAX Collection exclusive includes the Backmax massage system. With more than 40 years experience, MAAX knows the many economic, time, space, design, structural and functional considerations involved in creating the perfect bathroom. MAAX is a North American company with eight manufacturing plants throughout the US and Canada. MAAX's world-class whirlpool tub operational systems provide you with the best quality, lead times and customer service in the industry. MAAX's research and development teams conduct extensive customer, trade and consumer consultations to uncover unmet needs before any project begins. MAAX's expert designers are constantly seeking fresh, new ideas that provide the comfort and performance in their whirlpool tubs. MAAX's whirlpool tubs have won many awards for design and performance. MAAX offers whirlpool tubs that meet the needs and budgets of every client and designs their bathroom suites to be your total bathroom solutions provider.